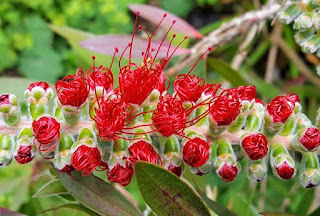 Now reclassified and correctly known as Melaleuca viminalis 'Captain Cook', Callistemon 'Captain Cook' is a selected seedling of Callistemon viminalis discovered in Queensland, Australia with a dwarf and bushy habit and considerably more floriferous while young. 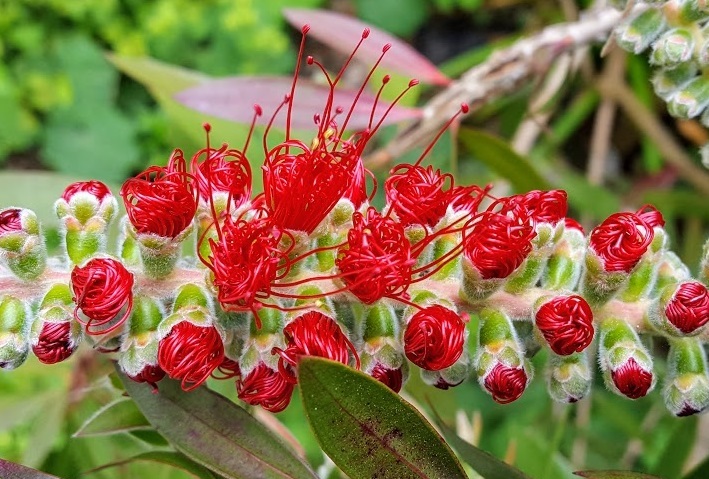 It was originally sold as Callistemon viminalis 'Compacta', but the cultivar name was changed to 'Captain Cook' in 1970 in honour of the bicentenary of Captain James Cook's voyage to Australia. 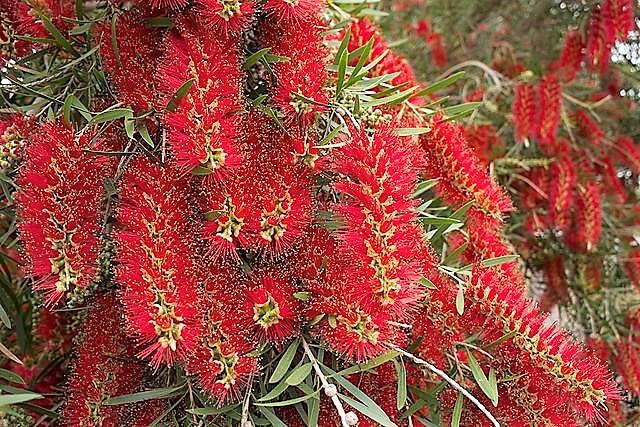 Since then it has becomes the world's most popular and widely sold form of all Callistemon species and cultivars. 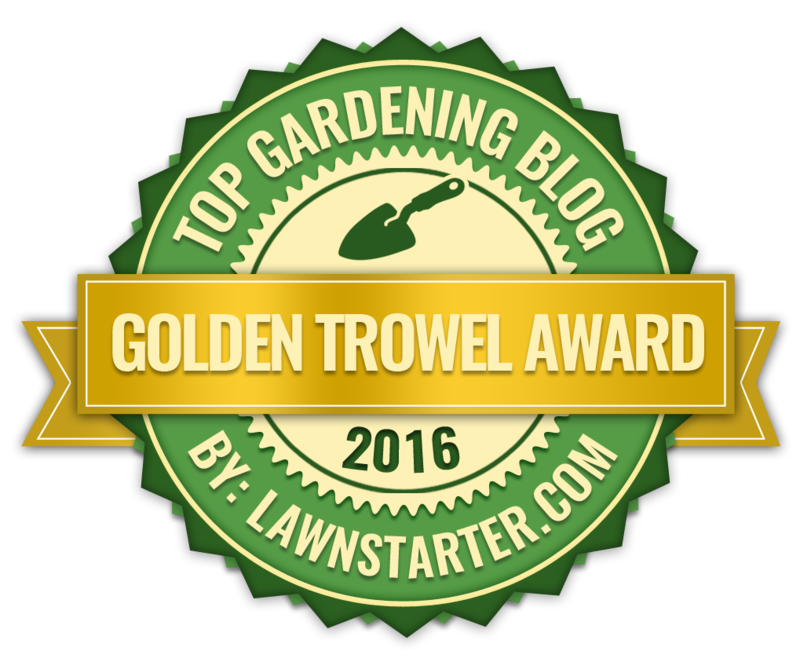 It is a dense, slightly weeping evergreen shrub which under favourable conditions will reach a height and spread of between 1.5–2.5 metres. The bark becomes fissured with age while the narrow lance-shaped leaves are approximately 50 to 60 mm long and emit a lemon-like fragrance when crushed. The bright red, flowers are reminiscent of a bottlebrush (hence the common name of 'Bottlebrush') appearing from early June with further blooms sometimes occurring in late summer or autumn. The eye-catching inflorescences are actually prominent bundles of long stamens! 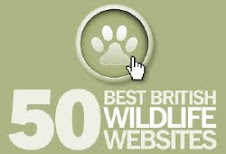 In its native habitat the original species is usually found along water courses on soils over sandstone or granite so when planting as a garden specimen best results are achieved by providing a moist well-drained neutral to slightly acidic soils. Avoid areas prone to waterlogging and be aware that Callistemon viminalis has proven to perform poorly when grown on thin soils over chalk. In northern European climates Callistemon 'Captain Cook' is perfectly hardy in the milder regions such as southern England and Ireland. Plant in full sun, but further north it will require the shelter of a south-facing wall as well as some winter protection by way of several layers of horticultural fleece. In regions which regularly experience ongoing freezing temperatures Callistemon 'Captain Cook' is probably best grown as a container specimen so that it can be brought in under protection during the winter. Prune back lightly after flowering but only to just behind the spent flower structures. Avoid cutting into leafless wood.